Please select an area you are interested in to see related testimonials. "The Keep it Real game allowed me to search deeper within myself to find meaning in many of the things that I do. The game creatively asks the questions that most people are too intimidated to ask, boldly unmasks truths that desperately need to be revealed, and enlightens the mind. 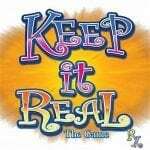 The Keep it Real game harbors a magic that changes people… and will one day change the world." "A safe space…at last…to finally discover things about yourself you always wanted to know, to say things you have always wanted to say, and to be who you really are! Keep It Real is a game where we discover, uncover, reveal and share. We listen, learn and grow new understandings. We open up to new places within, find answers, gain awareness, unstick ourselves and let go of old stuff. Thank you for this game." "Created with love... Transformed through passion... Keep It Real is an inspirational game; evoking inner peace, positive thinking and change." "Keep It Real is a game to be played by anyone, anywhere, any place, any time; it is a game that everyone needs."